Continue your journey to Jaipur , the land of the Rajahs. 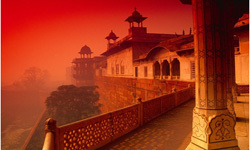 Jaipur was the capital of Rajasthan province. Everywhere you will see the monuments of its Mughal rulers. Jaipur is one of the main centers for shopping in India -- especially with regard to textiles, jewelry, stones carpets, etc. Ambling camels and brightly dressed locals, reflect Jaipur’s desert heritage while the teeming markets display a profusion of handlooms and crafts. This afternoon visit the City Palace, home to an impressive collection of traditional Rajasthai and Mughal artwork, jewels, textiles and arms; Jantar Mantar; and the Hawa Mahal, or Palace of Winds, a tall facade of almost one thousand windows, behind which royal ladies once took the air in privacy. The City Palace in the heart of the old city is a blend of Rajasthani and Mughal architecture. The center of the palace is a seven-storied building called the Chandra Palace, with fine views of the garden and the city. At approximately 9:00 AM be ready in the lobby of the hotel in preparation for your overland journey to Delhi. - Accommodation for total 06 nights sharing twin room on bed and breakfast basis.